A small, secretive group of insiders has been collaborating with large American foundations and industry to concentrate decision-making power concerning anti-tar sands campaigns. Headed by Michael Marx, one of the architects of the Great Bear Rainforest deal in northwestern British Columbia, these groups have a track record and a documented trail of funding relationships that steer them–whether they intend to or not–into closed-door, backroom deals with industry and government. The lack of transparency, the absence of any democratic structures, the questionable sources of funding, and the track record of these corporate and foundation-funded Environmental NGOs are the subjects of a new report by Macdonald Stainsby and Dru Oja Jay. 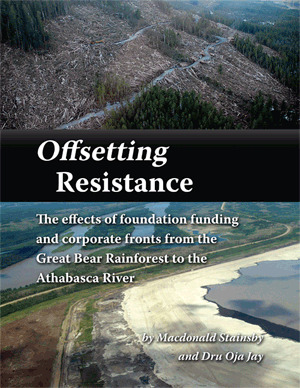 Offsetting Resistance: The effects of foundation funding from the Great Bear Rainforest to the Athabasca River examines the role of ForestEthics and other Environmental NGOs in the Great Bear Rainforest deal and in the Northwest Territories Protected Areas Strategy. From there, it reveals the hidden structures behind the emerging “North American Tar Sands Coalition,” which seeks to keeps its decision-making body “invisible to the outside,” while funnelling millions of dollars to its preferred groups — to the potential detriment and sidelining of community organizers across North America.